A flash. One Mississippi, two… BOOM! The thunderstorm was right on top of us. 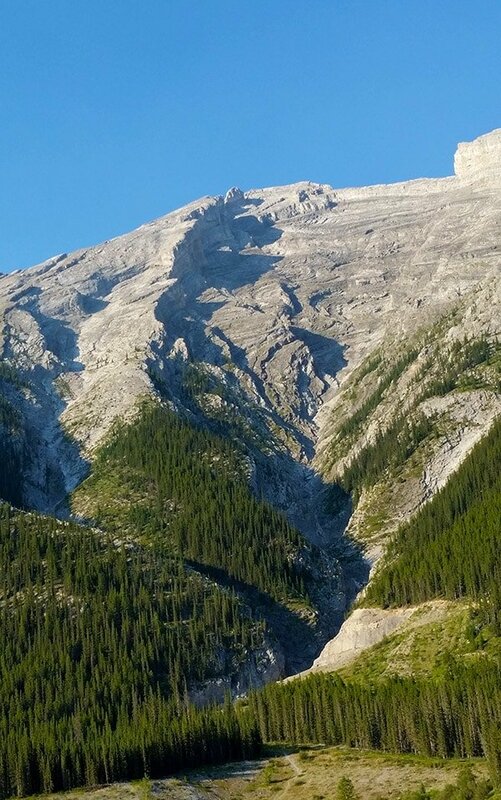 Kevin, Jeff and I, a trio of tenderfoot trout anglers, had decided that camping on the top of a cliff overlooking a box canyon in the Canadian Rockies was a great idea. Now, somewhere after 1 a.m., I was no longer so sure. No telling what Kevin and Jeff were thinking, as we were all in our own shelters. Jeff had been smart. He was in a lightweight tent. Kevin a bit less so, as he was sleeping under a tarp. But at least it was set up correctly. I couldn’t say the same about mine. I’d never set up a tarp shelter before, and, looking at the remains of a previous shelter in this camp — a line of paracord stretched between two tress over a peat moss bed — I’d decided to set up right there. Mistake. My sleeping bag stuck out the end of the tarp, which was squinched up between the trees, a full three feet shorter than it should have been. The sides of the tarp drooped in the downpour. One side touched my face, which was being pelted by rain, with only the fabric of the tarp as protection. Finally, the rain stopped. In came a rush of wind, and, just like that, the temperature dropped 15 degrees in a heartbeat. I went from wet to wet-and-shivering. So this was backcountry camping. Great… What had I gotten myself into? 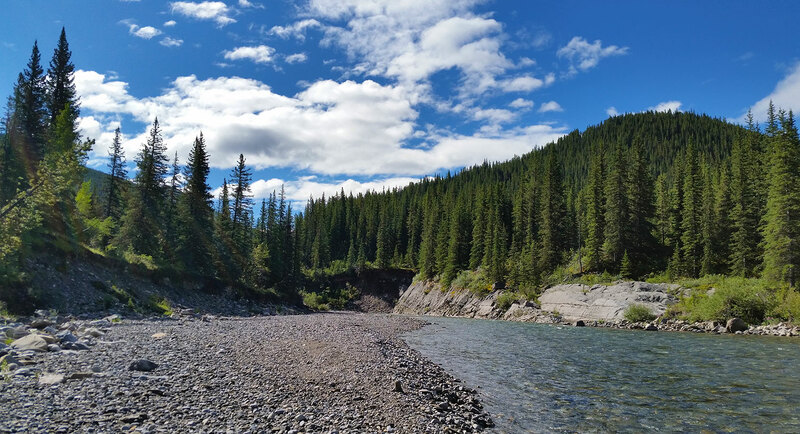 Kevin had suggested this trip, a backcountry trout fishing trip up the Ram River in Alberta, his home province. 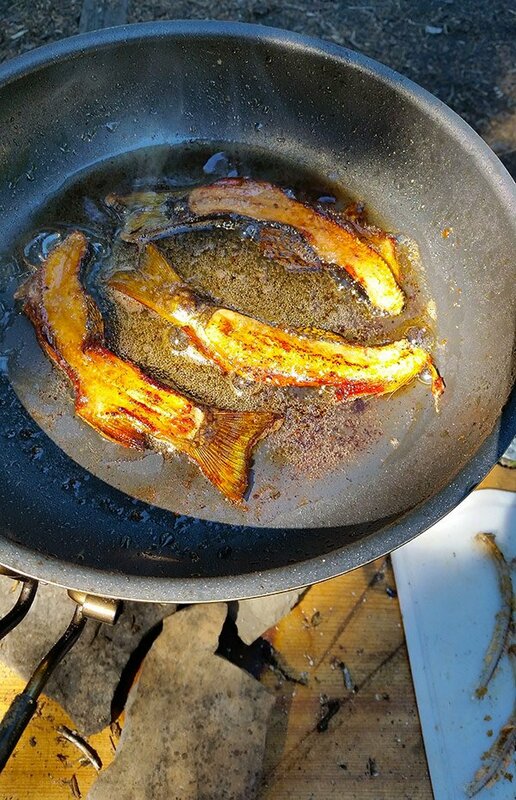 We’d be shooting an episode of Kevin’s TV show From the Wild, and the idea was to forage and fish our way as far up river as we could manage, living off West Slope cutthroat trout and wild produce. Almost immediately things went sideways. Several places we’d wanted to fish were closed because of grizzly bears or fire. Another turned out to be catch-and-release only. That left only the Ram, where the size limit to keep a trout was 30 cm, or 12 inches. No problem, we thought. This is Canada, home of giant fish, right? We hiked upriver full of hope and promise. But not a mile into it, a fearsome box canyon stopped us in our tracks. Towering walls of agglomerated natural concrete and twisted sedimentary rock hemmed us in, and a sizable waterfall blocked the path upstream. Jeff soon found our campsite, however, after scrambling up the cliff on a goat trail. We set up, visions of mule deer chops and Jeff’s homemade brats competing with daydreams of chunky cutthroats roasting on a spit. Dusk comes late in Alberta in July, and we found ourselves happily fishing well past 9 p.m. Jeff and Kevin were having no luck with their fly rods. I can’t cast a fly rod to save my life, so I brought a spinning rod and an array of shiny lures: Panther Martins, Kastmasters, Mepps spinners, that sort of thing. 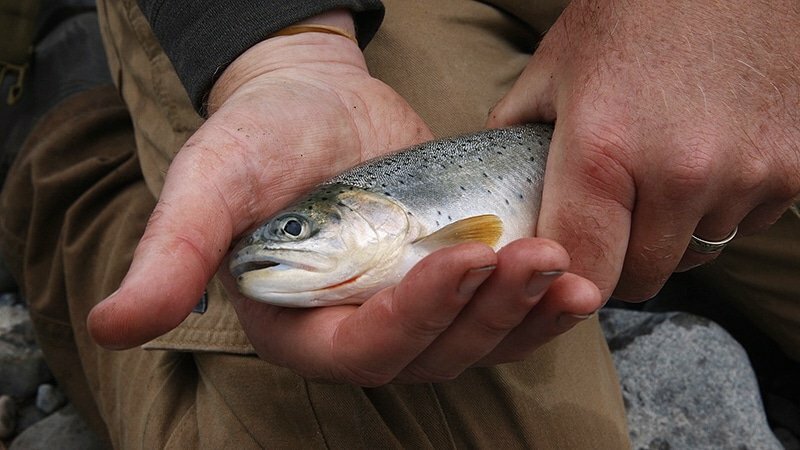 Very quickly I hooked the smallest trout I’d ever caught, a four-inch cutthroat. I let it go and cast into deeper pools. Another fish. Nicer, but still short of the magic 12-inch marker. They are lovely little things, these cutthroats. You can see why they call them that in the picture; it’s the red line on their throats. Dinner was meaty and delicious, albeit fishless, and we planned our hike up river for the next day. We’d parallel the Ram on a horse path, fishing pool to pool. We talked about curing trout, kiting them by a fire, roasting them on a spit. But our conversation was cut short by rain, which became a thunderstorm. Dawn broke and I was miserable. Frost touched the dark pockets of our camp, and everything was wet. Coming from the hottest Sacramento summer in years didn’t help. I was used to lows in the 60s, not 30s. I kept waiting for a bear to wander in. I was not a happy camper. Once we got the fire back and some coffee in me, I began to feel better. This had been the worst night I’d ever spent outside, and it was past me. We loaded day packs and headed off, again, full of hope. Again, the plan fell to pieces. The horse trail often took us far from the river, so we’d have to bushwhack our way through — in well-known grizzly bear country. Jeff had a rifle, and we’d occasionally call out “hey bear!” but I’d be lying if I said I was not a bit on edge. I had never willingly put myself in grizzly country before. When we got to the river, we found it far lower than we’d imagined. Sure, there were pools, but most were less than five feet deep. Still, definitely fishable. Jeff and Kevin continued to be snakebit with their fly gear, and I continued to catch a steady stream of pretty little cutthroats. No keepers though. Slowly it began to dawn on me that maybe there weren’t any keepers in this stretch of river. Maybe this was it. So I began to focus on catching what the Ram River would give me. I am not an experienced trout angler. Sure, I’ve caught them in various ways over the years, but I have precious little experience with alpine rivers like the Ram. So consistently catching trout in the various pools we encountered felt like a victory, keepers or no. Casting a Panther Martin or somesuch to an exact spot 20 yards away, a spot you reckon there ought to be a fish, and then actually catching one made me forget a little about trout dinner. As the day wore on, Jeff and Kevin began to feel the lack of success. Neither had hooked a fish, and with me catching only teeny ones, morale suffered. Finally, we hit another box canyon, smaller than the first, yet still formidable. It was well into the afternoon and we’d hiked some five miles in rough country. Doneski. Finito. This was not going to work. We could hike more and more and maybe, just maybe, get into a larger class of fish — but our camp was already five miles behind us. 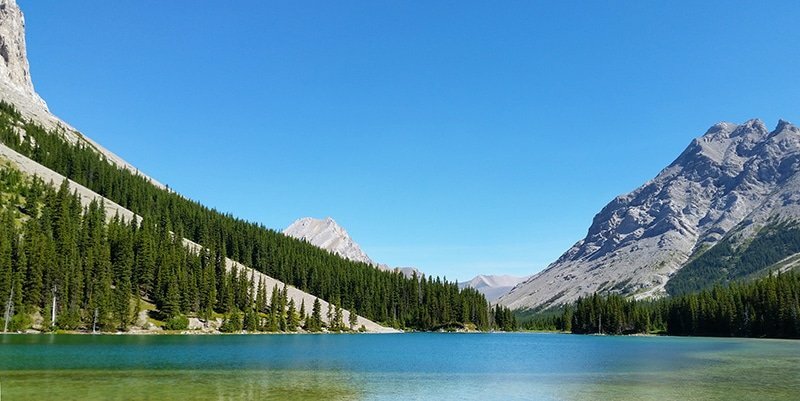 Sitting on a gravel bed sullenly eating energy bars, we hashed out a new plan: Break camp, hike back to the car and drive south to Elbow Lake, near Canmore, Alberta. There we’d find brook trout in a lake that had no size limit. There we should get the trout dinner we’d been longing for, and Kevin would get his food sequence for the show. Food sequence. Yeah… Kevin mentioned he needed one for this segment, too. And with no fish, it’d be up to me to find something in the bush to eat. Normally this would be no problem. I know a fair bit about Rocky Mountain foraging. But, weirdly, this stretch of ground was almost devoid of edible plants, and there were no edible mushrooms around, either. Perfect. Just about the only thing in abundance was fireweed, Chamaenerion angustifolium. OK, then. Fireweed it is. We gathered a bag full of mostly young shoots, which I ended up stewing with an onion, some garlic from Kevin’s garden, and some sweet butter from Jeff’s farm. I sliced some thin sheets of butter on the greens after they’d cooked about 30 minutes and called it good. 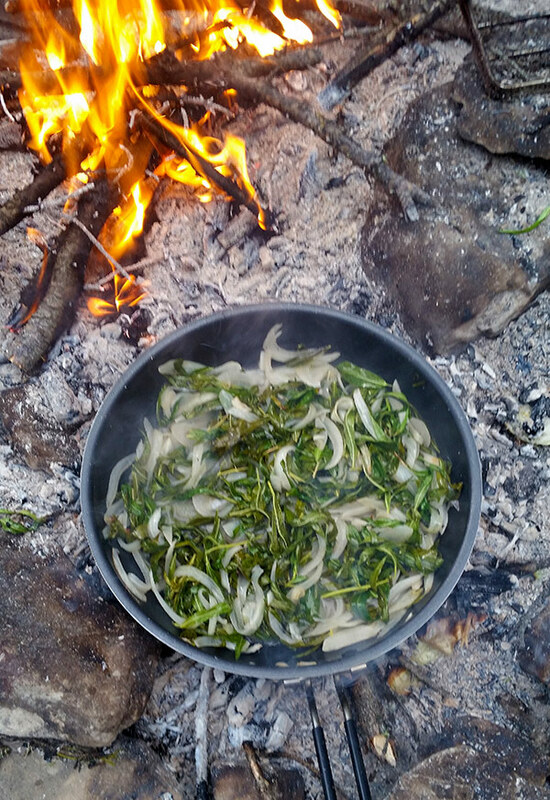 It was, with a flavor a bit like stewed collards. I rearranged my tarp shelter and had a much nicer night. I was learning this thing, slowly but surely. But the Ram River was not yet done testing us. Hiking out the next morning, Jeff thought that the horse trail would take us back to a river crossing, so we would not have to scale down the goat trail into the box canyon we’s started in. So off we went. Several miles later, realizing that our car was certainly behind us on the other side of the river, it became apparent we’d need to do some major bushwhacking. We could barely hear the river. Now we knew we weren’t lost: The river was in front of us, somewhere. But I’d never been stuck in such thick bush before, and we were all laden down with gear. In grizzly country, remember. Eventually we did manage to find a way down to the river, then found a crossing, and our way back. By comparison, the rest of the trip was a dream. We hit Elbow Lake after a day’s drive south. The lake looks like many alpine lakes I’ve seen in the Sierra Nevada and other high mountain ranges. Gin clear, not a lot of organic matter in it, ringed by conifers and sheltered by barren, rocky peaks. Alas, now it was my turn to get skunked fishing. Brook trout were rising everywhere when we arrived, but I couldn’t buy a bite with my conventional gear. Kevin, on the other hand, quickly had two fish. I ran through every possible lure I had before giving up and switching to a casting bubble and a dry fly I borrowed from Kevin. That worked. On my first cast I caught a nice little brookie, maybe nine inches long. It was my first ever fish on a fly. After that, however, this trip’s relentless learning curve kicked in. I had trouble keeping the fly dry enough to float, and it took me a while to realize that I would not catch any fish unless that fly was on the surface. By the time I’d caught a second trout, Kevin had his limit of five. Poor Jeff’s luck still had no improved; he’d caught only a fingerling. 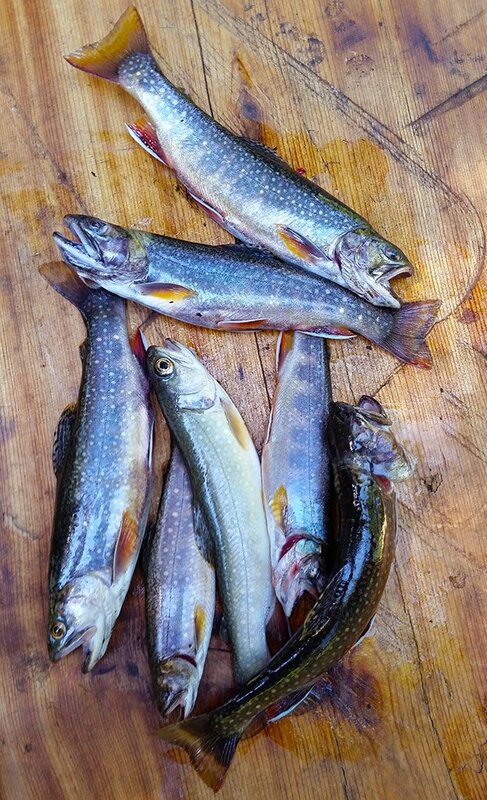 Fishing done, in kicked the last stage of this trip’s tutorial: What on earth to do with seven brook trout, each no longer than nine inches? Answer: Eat them all, and all of them. The three largest I filleted. We ate the little fillets fried in some oil. I packed the racks left over — I’d kept some meat on them on purpose — in salt and brown sugar. 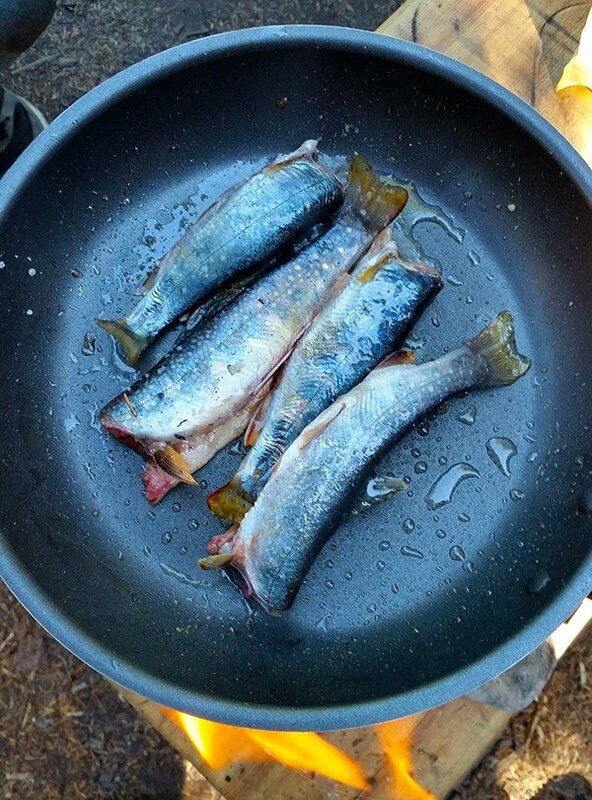 Then I fried the remaining little brookies whole. We ate them like ears of corn. Fish this small have edible fins and bones, you should know. What bones we had left from the whole fish I salted and sugared like the racks. I patted the racks dry and fried them in the oil. Good Lord were they amazing! Completely edible, like crunchy trout bacon. I plan on perfecting this recipe with Sierra trout soon and posting it. Finally, I fried the remaining bones in the rest of the hot oil until they stopped bubbling. Crunchy, salty, a little sweet. Nutty. A great bar snack. All three of us were overjoyed. Kevin got his photo sequence, I’d done something I’d never done before, and will definitely do again. What I will definitely not do again is hike up the Ram River. Or sleep under a tarp where temperatures get down to freezing. Or fish trout in alpine lakes without flies. I am left lingering over this trip with thoughts about how we grow as individuals. The famous Nietzsche saying “that which does not kill us makes us stronger” springs to mind. This was a mentally and physically tough adventure. I am sure there will be tougher in my future, but I don’t know if I’d even risk them had I not done this one. 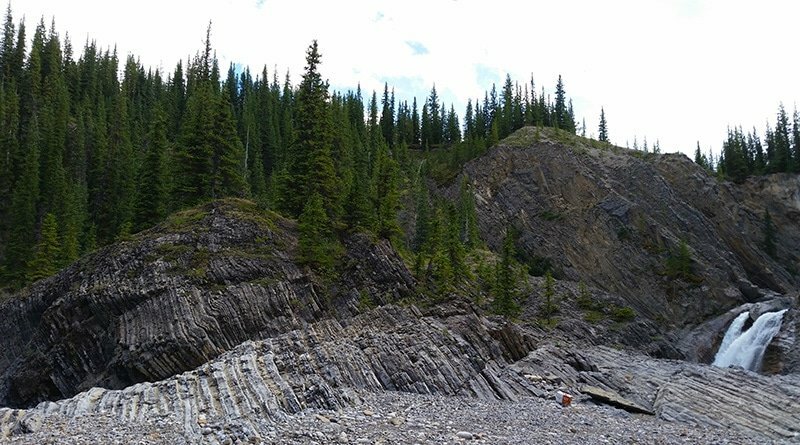 Ironically, a trip several thousand miles away to the Canadian Rockies was the spark I needed to pay more attention to the exact same environments less than two hours from my home. The Sierra Nevada has plenty of little alpine lakes stuffed with teeny brook trout, as well as streams with native rainbows and cutthroats. Until now, I’d not seen the value in catching a trout smaller than the bait I use in the Pacific. And I am no longer so reluctant to camp in the backcountry. Most of my life I’ve avoided camping; it just wasn’t my thing. Now I may be a late convert. So many firsts on this adventure. First real backountry camping. First time in grizzly country. First West Slope cutthroat trout. First really successful stream fishing for trout. First fish on a fly, albeit with a casting bubble. First night dealing with a horrific rainstorm. First time I’d appreciated the beauty of small trout at the table. I can assure you it won’t be the last time. Come back! It is not all tiny trout and thunderstorms here. We will spend the mornings down low catching enough rainbows, cut bows and brook trout to feed any campers. Afternoons up high catching cuttys and monster bull trout. Maybe bag a hair or some spruce grouse. To give your buddy some credit, the Ram is an awesome place and any trip can go sideways. Didn’t know you could eat fireweed. I will now never go hungry in western Canada.